CMG India, a professionals’ forum for measurement and quantitative analysis in IT enterprises, invites performance engineering and capacity management professionals to their fourth half-day event in Pune, on September 12th, 2014, 2:30pm, BMC Software (near Pune Golf Course). This event is free for anyone to attend. See here for details on how to register. The changes in technologies, customer requirements, and visualization and consumption of data demands has led multiple point products to integrate and evolve into a solution. The value of the solution is in the seamless flow of information through multiple product layers and consuming this information in real time. Many times, if the “time to consume” the data to build information is not within the agreed service levels, the data loses its value. Thus, timeliness and reliability are the two most important aspects of multi-layered application integration. In the IT Management domain, the data collection and the system analytics engines need to go hand-in-hand. The data collectors should feed the analytics serves in real-time, to enable it to build intelligent analysis and to do various sorts of data modelling to help IT Managers have the holistic view of the underlying system resources and let them perform a root cause analysis of any problem proactively. The more granular, and consistent data, the more accurate will be the analytics and capacity estimates. Sudhir Sangra is the Product Development Architect at BMC, leading data centre performance and availability solution suite. One of the focus area in recent time is fault tolerant, Load balance, real time data management. Mobile Device Tracking System handles the movement of 70K+ mobile devices in WiFI network and present valuable insides like, Most famous paths, crowded places on flowers, patterns of device movement in Wi-Fi network, device count on different flowers and Zones. The case study present optimization around handling heavy write operation and performing analytics on Oracle database. It demonstrate the effective use of Oracle performance monitoring tools like OEM, AWR & ADDM report. How to draw conclusions from reports and co-relate that with Oracle internal functioning to gain maximum benefit. OpenStack is open-source software which is used for building public or private clouds. Competitors include VMware, vCloud and Amazon Web Services (News – Alert), so steps need to be taken to make OpenStack as popular as possible in the competitive marketplace. OpenStack has become increasingly important to enterprises of all sizes as its reach extends beyond Web 2.0/SaaS companies, such as Workday, Webex and PayPal. OpenStack is now a major element of both enterprise cloud computing and broader cloud initiatives. Customers also need to know how well OpenStack performs, but OpenStack is complex with many subsystems and components, which makes it hard for customers or potential customers to predict how “different implementation decisions and changes proposed to OpenStack affect the whole system’s behavior and performance,” according to a statement from Mirantis. On top of this, there are many alternative cloud configurations where OpenStack can be installed and used. Benchmarking becomes very difficult because it’s hard to get results from just parts of OpenStack. What was needed is a way to find benchmarking on the entire OpenStack system, with a predefined cloud configuration, the company explained. The benchmarking tool would also need to come up with complex and reproducible scenarios on actual OpenStack deployments. In other words, customers basically need to monitor how well of a job OpenStack is doing. So IBM, SoftLayer (News – Alert) (part of IBM) and Mirantis have developed Rally. It’s a benchmarking tool that reports on OpenStack performance. In this session, we describe the details behind the process, talk about the Rally – Performance benchmarking tool , performance assessment strategies we used. We’ll also share our findings on key scalability and performance bottlenecks, validations approaches, and suggest solutions.Performance benchmarking of Openstack component – nova. Computer Measurement Group is a not-for-profit, worldwide organisation of IT professionals committed to sharing information and best practices focused on ensuring the efficiency and scalability of IT service delivery to the enterprise through measurement, quantitative analysis, and forecasting. CMG Inc, which is headquartered in New Jersey, USA was setup in 1975 and it now has more than 25 US and International Chapters. CMG India has been recently setup with the objective of networking performance engineering and capacity management professionals across India. Large IT systems across India need to process millions of transactions per day and CMG India will allow for the experts to share their experiences and learn from one another. The facilitation will be done through regional events across major cities, an annual conference, and posting technical articles on this site. See the CMG India website for more information. Please double-check the date/time/venue of the event at the above link. We try to ensure that PuneTech calendar listings are accurate, but occasional errors creep in. Note: you are currently subscribed to the PuneTech main newsfeed. However, there are lots of technology events happening in Pune every week, and most of those are not posted on the main newsfeed. If you want to be informed by email about all the tech events happening in Pune, you need to separately subscribe to the PuneTech Calendar. It’s free so what are you waiting for? Check out the PuneTech Calendar to get an idea of the kinds of events that you’re missing out on. CMG India, a professionals’ forum for measurement and quantitative analysis in IT enterprises, invites performance engineering and capacity management professionals to their second half-day event in Pune, on Friday, 20th December, 2:30pm, at TCS, Nagar Road. This event is free for anyone to attend. See CMGIndia website for details on how to register. Software applications have become larger and more complicated in design. This increased complexity and scale in software application design present difficult challenges in asserting software quality. Software instrumentation is an effective solution in measuring and improving a software application’s quality. By examining the data gathered by the various instruments, it is possible to determine the cause for the software application failure and a causal analysis of the context in which the failure happened can lead to improvement in the overall software quality. In this paper, we discuss about a generic instrumentation for software applications which can be used to assert software quality. We also discuss about architecture of this generic instrumentation. We illustrate the capabilities of this generic instrumentation using couple of case studies. Anand is currently a Senior Scientist at TCS Innovation Labs, Pune with research interests in Architecture, Processes, Systems, and Services. He has two decades of experience in the IT industry spanning across programming, architecture, and research. An introduction to protocols primarily used to share data for Real time systems along with a brief comparison with each other. Realtime systems have different requirements with respect to data delivery. There are protocols explicitly designed to deliver according to these specifications. Protocols analyzed are – DDS, STOMP and AMQP. Deepti is currently with Persistent Systems Performance Engineering Group. She has over 6.5 years experience in J2EE across a number of projects and domains. Deepti has done her B.E. Computers from Pune University. Traditional Capacity Assessment exercises come with their own challenges. This paper aims to cover how these challenges can be surpassed using Guerilla techniques, originally proposed by Dr. Neil Gunther. It introduces the concept of scalability and shows how Universal Scalability law (USL) can be employed to model scalability of the Systems realistically, combining both Hardware/Software aspects together. USL aids in arriving at maximum point of throughput, beyond which the system performance degrades. This paper, shows how this theoretical limit can be used to predict capacity of a live database server through a detailed case study. Prajakta is working as a Technology Architect, in NFRs technical focus group that specializes in Performance Engineering Activities at Infosys. She has over 9.5+ years of experience in software development, project management and Performance Engineering across various domains and technologies of applications. She has done M.S. (Software Systems) from BITS, Pilani and B.E. (CSE) from Govt. College of Engineering, Aurangabad. Please double-check the date/time/venue of the event at the original website/registration link. We try to ensure that PuneTech calendar listings are accurate, but occasional errors creep in. Yesterday, Pubmatic.com announced that it had raised $7.5 million in funding from Helion Venture Partners, Draper Fisher Jurvetson and Nexus Venture Partners. This is the third round of funding, and in all they have raised $18 million. Pubmatic, whose development team is entirely in Pune, is an Ad Optimization Platform that helps websites increase their ad revenues. We interviewed Mukul Kumar, the Pune-based Co-founder and Vice President of Engineering of Pubmatic to understand better what exactly Pubmatic does, and how it does it. Click on the “Play” button above to listen to the interview. If you don’t see a play button, or are unable to hear the interview for some reason, click here. 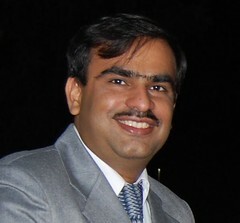 Mukul Kumar, is a founding engineer and VP of Engineering at Pubmatic. He is based in Pune and responsible for PubMatic’s engineering team. Mukul was previously the Director of Engineering at PANTA Systems, a high performance computing startup. Previous to that he joined Veritas India as the 13th employee and was Director of Engineering for the NetBackup group, one of Veritas’ main products. He has filed for 14 patents in systems software, storage software, and application software and proudly proclaims his love of ? and can recite it to 60 digits. Mukul is a graduate of IIT Kharagpur with a degree in electrical engineering. (This is the fourth in the PuneTech series of articles on optimization by Dr. Narayan Venkatasubramanyan, an Optimization Guru and one of the original pioneers in applying Optimization to Supply Chain Management. The first one was an ‘overview’ case study of optimization. The second was architecture of a decision support system. The third was optimization and organizational readiness for change. this is a follow-up to optimization: a case study. frequent references in this article to details in that article would make this one difficult to read for someone who hasn’t at least skimmed through that. the wikipedia article on optimization provides a great overview of the field. it does a thorough job by providing a brief history of the field of mathematical optimization, breaking down the field into its various sub-fields, and even making a passing reference to commercially available packages that help in the rapid development of optimization-based solutions. the rich set of links in this page lead to detailed discussions of each of the topics touched on in the overview. i’m tempted to stop here and say that my job is done but there is one slight problem: there is a complete absence of any reference to helicopter scheduling in an offshore oil-field. not a trace! this brings me to the biggest problem facing a young practitioner in the field: what to do when faced with a practical problem? of course, the first instinct is to run with the technique one is most familiar with. being among the few in our mba program that had chosen the elective titled “selected topics in operations research” (a title that i’m now convinced was designed to bore and/or scare off prospective students who weren’t self-selected card-carrying nerds), we came to the problem of helicopter scheduling armed with a wealth of text-book knowledge. this approach is one of the cornerstones of mathematical programming: given a practical situation to optimize, first write down a set of equations whose solutions have a one-to-one correspondence to the set of possible decisions. typically, these equations have many solutions. click here for an animated presentation that shows how the solutions to a system of inequalities can be viewed graphically. the other cornerstone is what is called an objective function, i.e., a mathematical function in those same variables that were used to describe the set of all feasible solutions. the solver is directed to pick the “best” solution, i.e., one that maximizes (or minimizes) the objective function. the set of constraints and the objective function together constitute a mathematical programming problem. the solution that maximizes (or minimizes) the objective function is called an optimal solution. the decisions the farmer needs to make are: how many acres of wheat to plant? how many acres of rye to plant? let us call these x and y respectively. so what values can x and y take? since we know that he has only 10 acres, it is clear that x+y must be less than 10.
the budget constraint implies that 200x + 100y <= 1200. again, should we not be asking why this farmer cannot borrow money if doing so will increase his returns? finally, the time constraint translates into x + 2y <= 12. can he not employ farm-hands to increase his options? the non-negativity constraints (x, y >= 0) are often forgotten. in the absence of these constraints, the farmer could plant a negative amount of rye because doing so would seem to get him more land, more money, and more time. clearly, this is practically impossible. as you will see if you were to scroll down that page, these inequalities define a triangular region in the x,y plane. all points on that triangle and its interior represents feasible solutions: i.e., if you were to pick a point, say (5,2), it means that the the farmer plants 5 acres each of wheat and 2 acres of rye. it is easy to confirm that this represents no more than 10 acres, no less than 7 acres, no more than $1200 and no more than 12 hours. but is this the best solution? or is there another point within that triangle? this is where the objective function helps. the objective is to maximize the profit earner, i.e., maximize 500x + 300y. from among all the points (x,y) in that triangle, which one has the highest value for 500x + 300y? this is the essence of linear programming. LPs are a subset of problems that are called mathematical programs. in practice, not all mathematical programs are equally hard. as we saw above, if all the constraints and the objective function are linear in the decision variables and if the decision variables can take on any real value, we have a linear program. this is the easiest class of mathematical programs. linear programming models can be used to describe, sometimes approximately,a large number of commercially interesting problems like supply chain planning. commercial packages like OPL, GAMS, AMPL, etc can be used to model such problems without having to know much programming. packages like CPLEX can solve problems with millions of decision variables and constraints and produce an optimal solution in reasonable time. lately, there have been many open source solvers (e.g., GLPK) that have been growing in their capability and competing with commercial packages. in many interesting commercial problems, the decision variables is required to take on discrete values. for example, a sortie that carries 1/3 of a passenger from point a to point b and transports the other 2/3 on a second flight from point a to point b would not work in practice. a helicopter that lands 0.3 in point c and 0.7 in point d is equally impractical. these variables have to be restricted to integer values. such problems are called integer programming problems. (there is a special class of problems in which the decision variables are required to be 0 or 1; such problems are called 0-1 programming problems.) integer programming problems are surprisingly hard to solve. such problems occur routinely in scheduling problems as well as in any problem that involves discrete decisions. commercial packages like CPLEX include a variety of sophisticated techniques to find good (although not always optimal) solutions to such problems. what makes these problems hard is the reality that the solution time for such problems grows exponentially with the growth in the size of the problem. another class of interesting commercial problems involves non-linear constraints and/or objective functions. such problems occur routinely in situations such refinery planning where the dynamics of the process cannot be described (even approximately) with linear functions. some non-linear problems are relatively easy because they are guaranteed to have unique minima (or maxima). such well-behaved problems are easy to solve because one can always move along an improving path and find the optimal solution. when the functions involved are non-convex, you could have local minima (or maxima) that are worse than the global minima (or maxima). such problems are relatively hard because short-sighted algorithms could find a local minimum and get stuck in it. fortunately for us, the helicopter scheduling problem had no non-linear effects (at least none that we accounted for in our model). unfortunately for us, the discrete constraints were themselves extremely hard to deal with. as we wrote down the formulation on paper, it became quickly apparent that the sheer size and complexity of the problem was beyond the capabilities of the IBM PC-XT that we had at our disposal. after kicking this idea around for a bit, we abandoned this approach. we would then traverse this tree enumerating all the paths and evaluating them for their total cost. finally, we would pick the “best” path and publish it to the radio operator. at first, this may seem ridiculous. the explosion of possibilities meant that this tree was daunting. there were several ways around this problem. firstly, we never really explicitly enumerated all possible paths. we built out the possibilities as we went, keeping the best solution until we found one that was better. although the number of possible paths that a helicopter could fly in the course of a sortie was huge, there were simple rules that directed the search in promising directions so that the algorithm could quickly find a “good” sortie. once a complete sortie had been found, the algorithm could then use it to prune searches down branches that seemed to hold no promise for a better solution. the trick was to tune the search direction and prune the tree without eliminating any feasible possibilities. of course, aggressive pruning would speed up the search but could end up eliminating good solutions. similarly, good rules to direct the search could help find good solutions quickly but could defer searches in non-obvious directions. since we were limited in time, so the search tree was never completely searched, so if the rules were poor, good solutions could be pushed out so late in the search that they were never found, at least not in time to be implemented. one of the nice benefits of this approach was that it allowed the radio operator to lock down the first few steps in the sortie and leave the computer to continue to search for a good solution for the remainder of the sortie. this allowed the optimizer to continue to run even after the sortie had begun. this bought the algorithm precious time. allowing the radio operator the ability to override also had the added benefit of putting the user in control in case what the system recommended was infeasible or undesirable. notice that this approach is quite far from mathematical programming. there is no guarantee of an optimal solution (unless one can guarantee that pruning was never too aggressive and that we exhaustively searched the tree, neither of which could be guaranteed in practical cases). nevertheless, this turned out to be quite an effective strategy because it found a good solution quickly and then tried to improve on the solution within the time it was allowed. this may be a good juncture for an aside: the field of optimization has traditionally been the domain of operations researchers (i.e., applied mathematicians and industrial engineers). even though the field of artificial intelligence in computer science has been the source of many techniques that effectively solve many of the same problems as operations research techniques do, OR-traditionalists have always tended to look askance at their lowly competitors due to the perceived lack of rigour in the AI techniques. this attitude is apparent in the wikipedia article too: after listing all the approaches that are born from mathematical optimization, it introduces “non-traditional” methods with a somewhat off-handed “Here are a few other popular methods:” i find this both amusing and a little disappointing. there have been a few honest attempts at bringing these two fields together but a lot more can be done (i believe). it would be interesting to see how someone steeped in the AI tradition would have approached this problem. perhaps many of the techniques for directing the search and pruning the tree are specific instances of general approaches studied in that discipline. if there is a moral to this angle of our off-shore adventures, it is this: when approaching an optimization problem, it is tempting to shoot for the stars by going down a rigorous path. often, reality intrudes. even when making technical choices, we need to account for the context in which the software will be used, how much time there is to solve the problem, what are the computing resources available, and how it will fit into the normal routine of work. this article is the fourth in the series of short explorations related to the application of optimization. i’d like to share what i’ve learned over a career spent largely in the business of applying optimization to real-world problems. interestingly, there is a lot more to practical optimization than models and algorithms. each of the the links leads to a piece that dwells on one particular aspect. Dr. Narayan Venkatasubramanyan has spent over two decades applying a rare combination of quantitative skills, business knowledge, and the ability to think from first principles to real world business problems. He currently consults in several areas including supply chain and health care management. As a Fellow at i2 Technologies, he tackled supply chains problems in areas as diverse as computer assembly, semiconductor manufacturer, consumer goods, steel, and automotive. Prior to that, he worked with several airlines on their aircraft and crew scheduling problems. He topped off his days at IIT-Bombay and IIM-Ahmedabad with a Ph.D. in Operations Research from the University of Wisconsin-Madison. (This is the third in the PuneTech series of articles on optimization by Dr. Narayan Venkatasubramanyan, an Optimization Guru and one of the original pioneers in applying Optimization to Supply Chain Management. The first one was an ‘overview’ case study of optimization. The second was architecture of a decision support system. most discussions of optimization tend to focus on the technical details of problem formulation, algorithm design, the use of commercially available software, implementation details, etc. a fundamental point gets lost in that approach to this topic. in this piece, we will focus on that point: organizational readiness for change. the introduction of optimization in the decision-making process almost always requires change in that process. processes exist in the context of an organization. as such, when introducing change of this nature, organizations need to be treated much the same way a doctor would treat a recipient of an organ. careful steps need to be take to make sure that the organization is receptive to change. before the change is introduced, the affected elements in the organization need to be made aware of the need for change. also, the organization’s “immune system” needs to be neutralized while the change is introduced. the natural tendency of any organization to attack change and frustrate the change agent needs to be foreseen and planned for. a project needs “air cover” from the executive level. at the project level, it needs a champion who will serve as the subject-matter expert, evangelist, manager, and cheerleader. at the implementation level, it needs a group of people who are intimately familiar with the inner workings of the existing IT infrastructure. an executive sponsor is vital to ensuring that the team is given the time and resources it needs to succeed even as changes in circumstances cause high-level priorities to change. during the gestation period of a project — a typical project tends to take several months — the project team needs the assurance that their budget will be safe, the priorities that guide their work will remain largely unchanged, and the team as a whole will remain free of distractions. a project champion is the one person in the client organization whose professional success is completely aligned with the success of the project. he/she stands to get a huge bonus and/or a promotion upon the success of the project. such a person keeps the team focused on the deliverable, keeps the executive sponsor armed with all the information he/she needs to continue to make the case for the project, and keeps all affected parties informed of impending changes, in short, an internal change agent. in order to achieve this, the champion has to be from the business end of the organization, not from the IT department. unfortunately, most projects tend to focus on the third of the elements. strength in the implementation team alone will not save project that lacks a sponsor or a champion. let us examine the helicopter scheduling project in this light. it could be argued that executive sponsorship for this project came from the highest possible level. i heard once that our project had been blessed by the managing directors of the two companies. unfortunately, their involvement didn’t extend anywhere beyond that. neither managing director helped shape the project organization for success. who was our champion? there was one vitally important point that i mentioned in passing in the original narrative: the intended users of the system were radio operators. they reported to an on-shore manager in the electronics & telecommunication department. in reality, their work was intimately connected to the production department, i.e., the department that managed the operations in the field. as such, they were effectively reporting to the field production supervisor. the radio operators worked very much like the engineers in the field: they worked all day every day for 14 days at a time and then went home for the next 2 weeks. each position was manned by two radio operators — more about them later — who alternately occupied the radio room. as far as their helicopter-related role was concerned, they were expected to make sure that they did the best they could do to keep operations going as smoothly as possible. their manager, the person who initiated the project, had no direct control over the activities of the radio operator. meanwhile, the field production supervisor was in charge of maintaining the efficient flow of oil out of the field. the cost of helicopter operations was probably a miniscule fraction of the picture they viewed. because no one bore responsibility for the efficiency of helicopter usage, no one in the client organization really cared about the success of our project. unfortunately, we were neither tasked nor equipped to deal with this problem (although that may seem odd considering that there were two fresh MBAs on the team). in hindsight, it seems like this project was ill-structured right from the beginning. the project team soldiered on in the face of these odds, oblivious to the fact that we’d been dealt a losing hand. should the final outcome have ever been a surprise? this article is the third in a series of short explorations related to the application of optimization. i’d like to share what i’ve learned over a career spent largely in the business of applying optimization to real-world problems. interestingly, there is a lot more to practical optimization than models and algorithms. each of the the links below leads to a piece that dwells on one particular aspect. (PuneTech is honored to have Dr. Narayan Venkatasubramanyan, an Optimization Guru and one of the original pioneers in applying Optimization to Supply Chain Management, as our contributor. I had the privilege of working closely with Narayan at i2 Technologies in Dallas for nearly 10 years. For Dr. Narayan Venkatasubramanyan’s detailed bio, please click here. the job of the data layer is to capture all the data that is relevant and material to the decision at hand and to ensure that this data is correct, up-to-date, and easily accessible. in our case, this would include master/static data such as the map of the field, the operating characteristics of the helicopter, etc as well as dynamic data such as the requirements for the sortie, ambient conditions (wind, temperature), etc. this may seem rather obvious at first sight but a quick reading of the case study shows that we had to revisit the data layer several times over the course of the development of the solution. as the name implies, the visibility layer provides visibility into the data in a form that allows a human user to exercise his/her judgment. very often, a decision-support system requires no more than just this layer built on a robust data layer. for example, we could have offered a rather weak form of decision support by automating the capture of dynamic data and presenting to the radio operator all the data (both static and dynamic), suitably filtered to incorporate only parts of the field that are relevant to that sortie. he/she would be left to chart the route of the helicopter on a piece of paper, possibly checking off requirements on the screen as they are satisfied. even though this may seem trivial, it is important to note that most decision-support systems in everyday use are rather lightweight pieces of software that present relevant data to a human user in a filtered, organized form. the human decision-maker takes it from there. the predictive/simulation layer offers an additional layer of help to the human decision-maker. it has the intelligence to assess the decisions made (tentatively) by the user but offers no active support. for instance, a helicopter scheduling system that offers this level of support would present the radio operator with a screen on which the map of the field and the sortie’s requirements are depicted graphically. through a series of mouse-clicks, the user can decide whom to pick up, where to fly to, whether to refuel, etc. the system supports the user by automatically keeping track of the weight of the payload (passenger+fuel) and warning the user of violations, using the wind direction to compute the rate of fuel burn, warning the user of low-fuel conditions, monitoring whether crews arrive at their workplace on time, etc. in short, the user makes decisions, the system checks constraints and warns of violations, and provides a measure of goodness of the solution. few people acknowledge that much of corporate decision-making is at this level of sophistication. the widespread use of microsoft excel is clear evidence of this. the optimization layer is the last of the layers. it wrests control from the user and actively recommends decisions. it is obvious that the effectiveness of optimization layer is vitally dependent on the data layer. what is often overlooked is that the acceptance of the optimization layer by the human decision-maker often hinges on their ability to tweak the recommendations in the predictive layer, even if only to reassure themselves that the solution is correct. often, the post-optimization adjustments are indispensable because the human decision-maker knows things that the system does not. the term “decision-support system” may seem a little archaic but i will use it here because my experience with applying optimization has been in the realm of systems that recommend decisions, not ones that execute them. there is always human intervention that takes the form of approval and overrides. generally speaking, this is a necessary step. the system is never all-knowing. as a result, its view of reality is limited, possibly flawed. these limitations and flaws are reflected in its recommendations. this invites the question: if there are known limitations and flaws in the model, why not fix them? this is an important question. the answer to this is not nearly as obvious as it may appear. before we actually construct a model of reality, we must consciously draw a box around that portion of reality that we intend to include in the model. if the box is drawn too broadly, the model will be too complex to be tractable. if the box is drawn too tightly, vital elements of the model are excluded. it is rare to find a decision problem in which we find a perfect compromise, i.e., we are able to draw a box that includes all aspects of the problem without the problem becoming computationally intractable. unfortunately, it is hard to teach the subtleties of modeling in a classroom. in an academic setting, it is hard to wrestle with the messy job of making seemingly arbitrary choices about what to leave in and what to exclude. therefore, most students of optimization enter the real world with the impression that the process of modeling is quick and easy. on the contrary, it is at this level that most battles are won or lost. note: the term modeling is going to be unavoidably overloaded in this context. when i speak of models, students of operations research may immediately think in terms of mathematical equations. those models are still a little way down the road. at this point, i’m simply talking about the set of abstract interrelationships that characterize the behaviour of the system. some of these relationships may be too complex to be captured in a mathematical model. as a result, the mathematical model is yet another level removed from reality. consider our stumbling-and-bumbling approach to modeling the helicopter scheduling problem. we realized that the problem we faced wasn’t quite a text-book case. our initial approach was clearly very narrow. once we drew that box, our idealized world was significantly simpler than the real world. our world was flat. our helicopter never ran out of fuel. the amount of fuel it had was never so much that it compromised its seating capacity. it didn’t care which way the wind was blowing. it didn’t care how hot it was. in short, our model was far removed from reality. we had to incorporate each of these effects, one by one, because their exclusion made the gap between reality and model so large that the decisions recommended by the model were grossly unrealistic. it could be argued that we were just a bunch of kids who knew nothing about helicopters, so trial-and-error was the only approach to determining the shape of the box we had to draw. if you were to examine what we did in the light of the four-layer architecture described above, you’d notice that we really only built two of the four: the data layer and the optimization layer. this is a tremendously risky approach, an approach that has often led to failure in many other contexts. it must be acknowledged that optimization experts are rarely experts in the domain that they are modeling. nevertheless, by bypassing the visibility and predictive layers, we had sealed off our model from the eyes of people who could have told us about the flaws in it. we added the fuel capacity and consumption rate of each helicopter to the data layer. and modified the search algorithm to “remember” the fuel level and find its way to a fuel stop before the chopper plunged into the arabian sea. we added the payload limit to the data layer. and further modified search algorithm to “remember” not to pick up too many passengers too soon after refueling or risk plunging into the sea with 12 people on board. we captured the wind direction in the data layer and modified the computation of the distance matrix used in the optimization layer. we captured the ambient temperature as well as the relationship between temperature and maximum payload in the data layer. and we further trimmed the options available to the search algorithm. we could have continued down this path ad infinitum. at each step, our users would have “discovered” yet another constraint for us to include. back in those days, ongc used to charter several different helicopter agencies. i remember one of the radio operator telling me that some companies were sticklers for the rules while others would push things to the limit. as such, a route was feasible or not depending on whether the canadian company showed up or the italian one did! should we have incorporated that too in our model? how is one to know? this question isn’t merely rhetorical. the incorporation of a predictive/simulation layer puts the human decision-maker in the driver’s seat. if we had had a simulation layer, we would have quickly learned the factors that were relevant and material to the decision-making process. if the system didn’t tell the radio operator which way the wind was blowing, he/she would have immediately complained because it played such a major role in their choice. if the system didn’t tell him/her whether it was the canadian or the italian company and he didn’t ask, we would know it didn’t matter. in the absence of that layer, we merrily rushed into what is technically the most challenging aspect of the solution. implementing an optimization algorithm is no mean task. it is hugely time-consuming, but that is really the least of the problems. optimization algorithms tend to be brittle in the following sense: a slight change in the model can require a complete rewrite of the algorithm. it is but human that once one builds a complex algorithm, one tends to want the model to remain unchanged. one becomes married to that view of the world. even in the face of mounting evidence that the model is wrong, one tends to hang on. in hindsight, i would say we made a serious mistake by not architecting the system to validate the correctness of the box we had drawn before we rushed ahead to building an optimization algorithm. in other words, if we had built the solution systematically, layer by layer, many of the surprises that caused us to swing wildly between jubilation and depression would have been avoided. this article is the second in a series of short explorations related to the application of optimization. i’d like to share what i’ve learned over a career spent largely in the business of applying optimization to real-world problems. interestingly, there is a lot more to practical optimization than models and algorithms. each of the the links below leads to a piece that dwells on one particular aspect. PuneTech has published some introductory articles on Supply Chain Management (SCM) and the optimization & decision support challenges involved in various real world SCM problems. Who better to write about this area in further depth than Narayan! the year was 1985. i was fresh out of school, entering the “real” world for the first time. with a bachelors in engineering from IIT-Bombay and a graduate degree in business from IIM-Ahmedabad, and little else, i was primed for success. or disaster. and i was too naive to tell the difference. for those too young to remember those days, 1985 was early in rajiv gandhi‘s term as prime minister of india. he had come in with an obama-esque message of change. and change meant modernization (he was the first indian politician with a computer terminal situated quite prominently in his office). for a brief while, we believed that india had turned the corner, that the public sector companies in india would reclaim the “commanding heights” of the economy and exercise their power to make india a better place. CMC was a public sector company that had inherited much of the computer maintenance business in india after IBM was tossed out in 1977. quickly, they broadened well beyond computer maintenance into all things related to computers. that year, they recruited heavily in IIM-A. i was one of an unusually large number of graduates who saw CMC as a good bet. not too long into my tenure at at CMC, i was invited to meet with an mid-level manager in electronics & telecommunications department of the oil and natural gas commission of india (ONGC). the challenge he posed us was simple: save money by optimizing the utilization of helicopters in the bombay high oilfield. 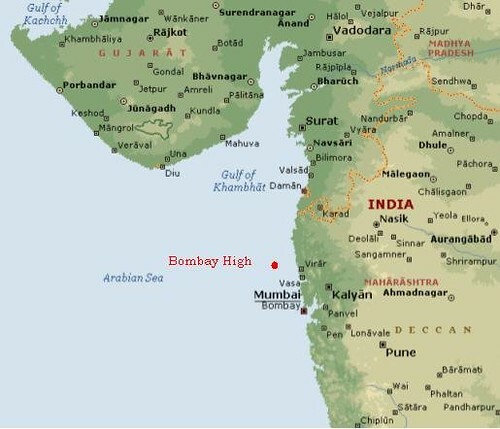 the bombay high oilfield is about 100 miles off the coast of bombay (see map). back then, it was a collection of about 50 oil platforms, divided roughly into two groups, bombay high north and bombay high south. movement of personnel between platforms in each of these groups was managed by a radio operator who was centrally located. all but three of these platforms were unmanned. this meant that the people who worked on these platforms had to be flown out from the manned platforms every morning and brought back to their base platforms at the end of the day. 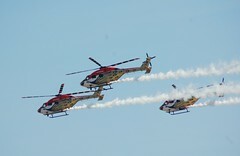 at dawn every morning, two helicopters, flew out from the airbase in juhu, in northwestern bombay. meanwhile, the radio operator in each field would get a set of requirements of the form “move m men from platform x to platform y”. these requirements could be qualified by time windows (e.g., need to reach y by 9am, or not available for pick-up until 8:30am) or priority (e.g., as soon as possible). each chopper would arrive at one of the central platforms and gets its instructions for the morning sortie from the radio operator. after doing its rounds for the morning, it would return to the main platform. at lunchtime, it would fly lunchboxes to the crews working at unmanned platforms. for the final sortie of the day, the radio operator would send instructions that would ensure that all the crews are returned safely to their home platforms before the chopper was released to return to bombay for the night. the challenge for us was to build a computer system that would optimize the use of the helicopter. the requirements were ad hoc, i.e., there was no daily pattern to the movement of men within the field, so the problem was different every day. it was believed that the routes charted by the radio operator were inefficient. given the amount of fuel used in these operations, an improvement of 5% over what they did was sufficient to result in a payback period of 4-6 months for our project. this was my first exposure to the real world of optimization. a colleague of mine — another IIM-A graduate and i — threw ourselves at this problem. later, we were joined yet another guy, an immensely bright guy who could make the lowly IBM PC-XT — remember, this was the state-of-the-art at that time — do unimaginable things. i couldn’t have asked to be a member of a team that was better suited to this job. we collected all the static data that we thought we would need. we got the latitude and longitude of the on-shore base and of each platform (degrees, minutes, and seconds) and computed the distance between every pair of points on our map (i think we even briefly flirted with the idea of correcting for the curvature of the earth but decided against it, perhaps one of the few wise moves we made). we got the capacity (number of seats) and cruising speed of each of the helicopters. we collected a lot of sample data of actual requirements and the routes that were flown. we debated the mathematical formulation of the problem at length. we quickly realized that this was far harder than the classical “traveling salesman problem”. in that problem, you are given a set of points on a map and asked to find the shortest tour that starts at any city and touches every other city exactly once before returning to the starting point. in our problem, the “salesman” would pick and/or drop off passengers at each stop. the number he could pick up was constrained, so this meant that he could be forced to visit a city more than once. the TSP is known to be a “hard” problem, i.e., the time it takes to solve it grows very rapidly as you increase the number of cities in the problem. nevertheless, we forged ahead. i’m not sure if we actually completed the formulation of an integer programming problem but, even before we did, we came to the conclusion that this was too hard of a problem to be solved as an integer program on a first-generation desktop computer. instead, we designed and implemented a search algorithm that would apply some rules to quickly generate good routes and then proceed to search for better routes. we no longer had a guarantee of optimality but we figured we were smart enough to direct our search well and make it quick. we tested our algorithm against the test cases we’d selected and discovered that we were beating the radio operators quite handily. then came the moment we’d been waiting for: we finally met the radio operators. they looked at the routes our program was generating. and then came the first complaint. “your routes are not accounting for refueling!”, they said. no one had told us that the sorties were long enough that you could run out of fuel halfway, so we had not been monitoring that at all! so we went back to the drawing board. we now added a new dimension to the search algorithm: it had to keep track of fuel and, if it was running low on fuel during the sortie, direct the chopper to one of the few fuel bases. this meant that some of the routes that we had generated in the first attempt were no longer feasible. we weren’t beating the radio operators quite as easily as before. we went back to the users. they took another look at our routes. and then came their next complaint: “you’ve got more than 7 people on board after refueling!”, they said. “but it’s a 12-seater!”, we argued. it turns out they had a point: these choppers had a large fuel tank, so once they topped up the tank — as they always do when they stop to refuel — they were too heavy to take a full complement of passengers. this meant that the capacity of the chopper was two-dimensional: seats and weight. on a full tank, weight was the binding constraint. as the fuel burned off, the weight constraint eased; beyond a certain point, the number of seats became the binding constraint. we trooped back to the drawing board. “we can do this!”, we said to ourselves. and we did. remember, we were young and smart. and too stupid to see where all this was going. in our next iteration, the computer-generated routes were coming closer and closer to the user-generated ones. mind you, we were still beating them on an average but our payback period was slowly growing. we went back to the users with our latest and greatest solution. they looked at it. and they asked: “which way is the wind blowing?” by then, we knew not to ask “why do you care?” it turns out that helicopters always land and take-off into the wind. for instance, if the chopper was flying from x to y and the wind was blowing from y to x, the setting was perfect. the chopper would take off from x in the direction of y and make a bee-line for y. on the other hand, if the wind was also blowing from x to y, it would take off in a direction away from y, do a 180-degree turn, fly toward and past y, do yet another 180-degree turn, and land. given that, it made sense to keep the chopper generally flying a long string of short hops into the wind. when it could go no further because they fuel was running low or it needed to go no further in that direction because there were no passengers on board headed that way, then and only then, did it make sense to turn around and make a long hop back. “bloody asymmetric distance matrix!”, we mumbled to ourselves. by then, we were beaten and bloodied but unbowed. we were determined to optimize these chopper routes, come hell or high water! so back we went to our desks. we modified the search algorithm yet another time. by now, the code had grown so long that our program broke the limits of the editor in turbo pascal. but we soldiered on. finally, we had all of our users’ requirements coded into the algorithm. or so we thought. we weren’t in the least bit surprised when, after looking at our latest output, they asked “was this in summer?”. we had now grown accustomed to this. they explained to us that the maximum payload of a chopper is a function of ambient temperature. on the hottest days of summer, choppers have to fly light. on a full tank, a 12-seater may now only accommodate 6 passengers. we were ready to give up. but not yet. back we went to our drawing board. and we went to the field one last time. in some cases, we found that the radio operators were doing better than the computer. in some cases, we beat them. i can’t say no creative accounting was involved but we did manage to eke out a few percentage point of improvement over the manually generated routes. you’d think we’d won this battle of attrition. we’d shown that we could accommodate all of their requirements. we’d proved that we could do better than the radio operators. we’d taken our machine to the radio operators cabin on the platform and installed it there. we didn’t realize that the final chapter hadn’t been written. 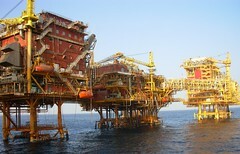 a few weeks after we’d declared success, i got a call from ONGC. apparently, the system wasn’t working. no details were provided. i flew out to the platform. i sat with the radio operator as he grudgingly input the requirements into the computer. he read off the output from the screen and proceeded with this job. after the morning sortie was done, i retired to the lounge, glad that my work was done. a little before lunchtime, i got a call from the radio operator. “the system isn’t working!”, he said. i went back to his cabin. and discovered that he was right. it is not that our code had crashed. the system wouldn’t boot. when you turned on the machine, all you got was a lone blinking cursor on the top left corner of the screen. apparently, there was some kind of catastrophic hardware failure. in a moment of uncommon inspiration, i decided to open the box. i fiddled around with the cards and connectors, closed the box, and fired it up again. and it worked! it turned out that the radio operator’s cabin was sitting right atop the industrial-strength laundry room of the platform. every time they turned on the laundry, everything in the radio room would vibrate. there was a pretty good chance that our PC would regress to a comatose state every time they did the laundry. i then realized that this was a hopeless situation. can i really blame a user for rejecting a system that was prone to frequent and total failures? this blog entry is intended to set the stage for a series of short explorations related to the application of optimization. i’d like to share what i’ve learned over a career spent largely in the business of applying optimization to real-world problems. interestingly, there is a lot more to practical optimization than models and algorithms. each of the the links below leads to a piece that dwells on one particular aspect. A large number of websites rely on advertising as their primary source of income. Typically the ads are served by third party ad networks (for example Google’s adsense). When an ad network is unable to find an appropriate ad for a specific page being served to a specific reader, they put in default or public service ads (PSAs). This is not good because the website makes no money from PSAs. Over the past several months we’ve studied just how severely default ads are affect our publishers and the numbers are jaw dropping. We found that ad networks defaulted 56% of the time on average and as much as 87% of the time. We also found that that the traditional static daisy chain of ad networks may be effective at reducing blank ads but is highly ineffective at maximizing a publisher’s revenue. Between 20% and 30% of publishers’ ad inventory is going to waste. This is of course terrible, if true. PubMatic’s default optimization service automates the reselling process, allowing publishers to instantly redirect unsold ad inventory back to PubMatic, which fills that inventory with the highest paying ad impression every time. PubMatic’s new service is an automated solution for the billion-dollar loss that plagues the industry. See also: The PuneTech wiki profile of Pubmatic , and Mukul Kumar, head of engineering at Pubmatic (based in Pune). Pune based online advertising optimization startup PubMatic has announced the availability of the PubMatic AdPrice Index – essentially a sort of an Sensex (or S&P 500 Index) for the online advertising world. The AdPrice Index essentially reports on the average online advertising revenues earned by 3000 web publishers worldwide who are PubMatic’s customers. And it only counts the income earned through use of ad networks like Google’s Adsense, or Yahoo! Publisher Network. Specifically, it does not account for revenues earned through ad spots sold directly, or through other channels like TextLinkAds or Amazon’s Affiliate marketing program. The index does give some breakup of the information – small niche websites earn more ($1.18 eCPM, i.e. earnings per 1000 pageviews) compared to large websites ($0.38 eCPM). However, variation across websites (based on the area, geography and other factors) is so large that I doubt that the actual numbers are directly useful to anybody. However, the main value I see is in the variation over time. PubMatic will release these numbers monthly, thus giving publishers a feel for the general state of the market – just like a stock market index for stocks. I am sure PubMatic is also in a position to answer the question on most bloggers mind – “Is there an ad network for me that performs better than AdSense?” However, PubMatic is not releasing a breakup of earnings by ad network. Of course, they want you to not care about this question. Because, if PubMatic works as advertised, you wont need to answer that question – PubMatic will automatically only show the most lucrative ads and in fact, their claim is that by allowing PubMatic to broker the ads between different ad networks on a per impression basis, you will end up earning more than you could have earned through any single ad network. Of course, this is not really guaranteed to work. The main problem is that information about earnings from individual ads is not directly available. Hence PubMatic has to guess. Here, it ends up using lots of complex mathematics (data-mining, machine learning, and I assume bayesian reasoning) to make those guesses. If all this guessing works in the case of your website, you will be richer (some websites report upto 90% increase in revenue), but it it does not, your revenues might actually drop a little bit. This can be especially true in the case of smaller websites in the early days of installing PubMatic – because its algorithms work better with more data. Smaller website + fewer days of operation = more chances of guessing wrong. The longer you keep PubMatic running, the better it should get. In theory. See analysis of this news at TechCrunch and at Mashable. eBay India), today announced an exclusive advertising relationship with Indian ad network Komli Media. Komli is now the exclusive seller of all of eBay India’s banner advertising inventory up to end March 2009. In addition, eBay India will also use Komli’s Pubmatic ad optimization service to improve ad revenues. Pubmatic can estimate the revenues that a website can earn from any particular ad, and thus improve revenues by comparing ads from different ad networks (e.g. Google Adsense, Yaho! Publisher Network, or even Komli itself) and then only showing those ads that are likely to generate the most revenue. This service (which is available free of cost to any web publisher) will now get used on eBay India’s pages. The Pubmatic service is developed in Komli’s engineering center in Pune.